JNN 03 Dec 2014 Yangoon : Myanmar’s government is forcing the minority Rohingya Muslims to leave the country, says a rights activist. “They want to drive all the Rohingya out of the country,” Saifullah Muhammad, a Rohingya activist, said on Saturday. The United Nations says the Rohingya Muslims of Myanmar are one of the most persecuted minorities in the world. The Muslims have been displaced by violence which has forced them to flee to neighboring countries. Muhammad added that human traffickers harass Rohingya refugees during their journey to countries such as Malaysia and Thailand, Press TV reported. “I didn’t expect the tragedy we faced on the way to come here (Malaysia). If I had known, I would never have come. I would rather die in my home,” said the 27-year-old refugee. Bibijan says she paid smugglers USD 2,500. Myanmar denies citizenship to most of the 1.3 million Rohingyas, placing restrictions on their movement, marriages and economic opportunities. Thailand and Malaysia have come under fire by human rights groups for mistreating the Rohingya refugees. 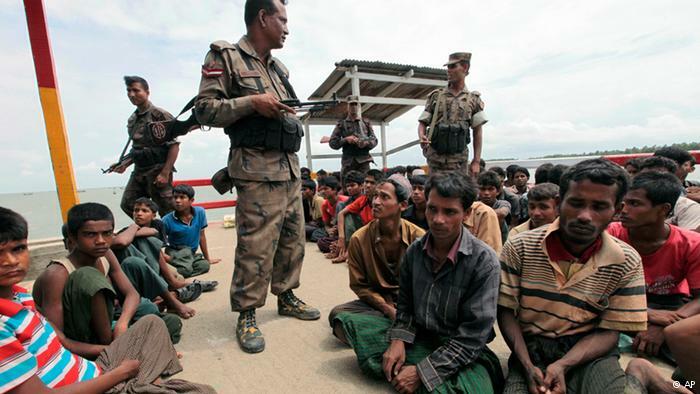 “Both Malaysia and Thailand have failed in their international obligation to provide protection to Rohingya. Even young able-bodied men sometimes don’t survive the journey,” said Dimitrina Petrova of the London-based group Equal Rights Trust. The UN recently approved a resolution calling on the government in Myanmar to grant full citizenship to the persecuted Muslim minority, piling up pressure on the country to cancel a controversial identity plan. This entry was posted in Asia Pacific and tagged Budhist, Government, Muslims, Myanmar, Rohingya, Rohingya Muslims, Rohingya refugees. Bookmark the permalink.